The medical industry is one of the fastest-growing sectors within additive manufacturing, and is used for a range of applications, from patient-specific implants to realistic functional prototypes and advanced medical tools. And with more than 97 percent of medical AM professionals confident that the use of additive manufacturing will continue to increase (SME’s 2017 Medical AM/3DP Survey), the technology holds huge potential in areas such as bioprinting and other medical applications. As part of our series exploring the impact of additive manufacturing on various industries, today we’re taking a look at the current applications of 3D printing within the medical sector, and how the technology is expected to evolve. How is the medical industry using 3D printing? The demand for faster and more cost-effective ways of producing customised products is one of the key factors behind the uptake in 3D printing within the medical sector. Thanks to greater design freedom and the ability to produce highly complex parts and components, additive manufacturing provides an ideal solution to the needs of the medical industry, and is therefore changing the way medical devices are made. First and foremost, additive manufacturing simplifies the process of designing and manufacturing custom devices. As each patient is different, medical devices, such as prosthetics and implants, must be customised to meet the needs of the patient in question. Traditionally, manufacturing complex medical devices has been a time-consuming and costly process, requiring expensive tooling. However, with advances in additive manufacturing, it is now much more cost-effective to produce complex medical devices, as the technology does not require tooling. In addition to this, the freedom of design afforded by AM technology means that it is now possible to produce complex devices that were previously impossible using traditional manufacturing methods. Another benefit of additive manufacturing is the speed with which it is possible to design and produce parts. If a 3D printed device requires any design iterations, this can be done in a matter of hours, resulting in a significantly reduced time-to-market for new medical devices. In terms of material, 3D printing systems used for medical applications can also support a range of biocompatible materials, which can withstand sterilisation by gamma radiation and ethylene oxide. Such materials are particularly well-suited for applications where compatibility with human tissue is a necessity, such as dental implants. Multi-material printing is also an emerging possibility, and this method can be used to create realistic human models with different materials representing organs, bones and soft tissues. 3D printed prototypes can greatly contribute to medical research by providing realistic anatomical models and prototypes. And as 3D printing speeds up the product design cycle, biomedical engineers can now create models and prototypes that much faster. For example, 3D printed models of cancerous tumours have been created to help medical professionals better understand how tumours develop and spread, as well as for cancer drug testing. Machining or injection moulding such kinds of prototypes would be impractical, as these technologies cannot offer the same quick iterations iterations and complexity of design as additive manufacturing. 3D printed models also allow physicians to visualise patient’s anatomy and assess complex pathologies directly, overcoming the challenges of digital images which lack 3-dimensional realism. And thanks to advances in multi-material 3D printing, additively manufactured models made up of different materials can be create to replicate characteristics of human tissues and bones. This method can help surgeons plan an operation in advance, and improve surgical precision and postoperative outcomes. With the global market for 3D-printed medical devices expected to reach more than $1 billion by 2026 (Future Market Insights), additive manufacturing offers significant value for the production of customised medical products. From complex-shaped implants, personalised prosthetics and hearing aids to fit-for-purpose tools, additive manufacturing enables the production of one-off devices that would be impractical to manufacture using traditional manufacturing. Today, one of the fastest growing segments within medical additive manufacturing is 3D-printed implants. Advances in AM have enabled the production of implants made to match the patient’s anatomy. Furthermore, with biocompatible materials such as titanium and cobalt chrome alloys, 3D-printed orthopaedic and cranial implants can be manufactured with the right surface roughness, resulting in reduced rejection rates. The possibility of creating topologically optimised designs also means that an implant can be designed with complex organic geometry and reduced weight. 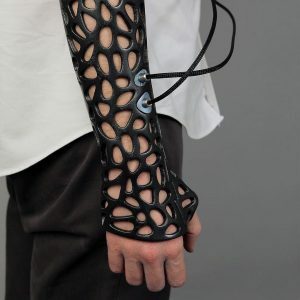 3D printing is also making a huge impact in the production of affordable yet highly accurate prosthetics. Using traditional manufacturing methods, it can take weeks to create a device matching a patient’s requirements. Today, this is no longer the case, as additively manufacturing prosthetics is significantly less time-consuming and, in many cases, can be produced at a fraction of the cost of traditionally fabricated prosthetics. 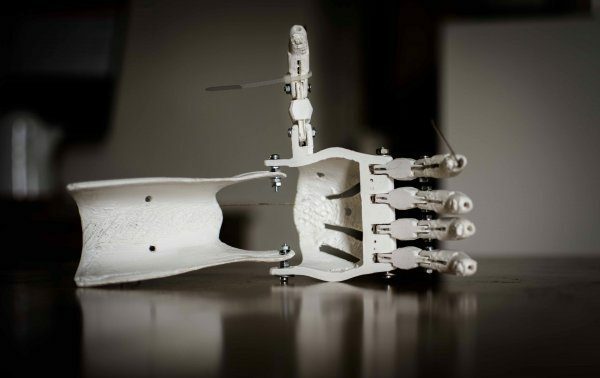 3D printing has been used to produce everything from prosthetic hands, legs, and braces to complex facial and cranial prosthetics. The hearing aid industry is another sector that has been transformed by the advent of 3D printing, with more than 90% of all hearing aids created using AM technology, particularly Stereolithography (SLA). SLA offers the quick production of organic shapes and as well as a high level of accuracy, ideal for customisation. According to a recent report by SmartTech Publishing, the dental market will reach $9.5 billion by 2027. 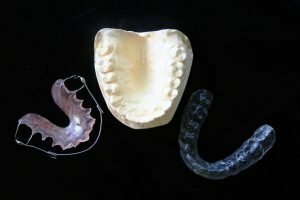 Today, dental labs can additively manufacture bridges, aligners, crowns, orthodontic appliances and stone models, which can be customised to fit the patent. Additive manufacturing can also be used in the medical sector to fabricate ancillary tools such as jigs and fixtures. 3D printed medical instruments can be delivered quickly and on demand, allowing advanced patient care. The use of additive manufacturing within the medical sector is not limited to operation planning and manufacturing. Medical marketing benefits from 3D printed models, which can be used by medical providers to demonstrate how a new medical device works. And as AM is well-suited for low volume production, 3D printed models are a cost-effective choice for medical schools, where students can experience improved training and practice using 3D printed anatomical replicas. The future of additive manufacturing within the medical industry is bright, with 3D bioprinting of functional tissues and organs receiving a great deal of attention. Bioprinting technology is currently used to help research drugs and pills, with significant use cases in regenerative medicine. Harrisburg University researchers, for example, use 3D printing to make contour-matched skin grafts out of human cells, and scientists at the University of Oxford have devised a new method to 3D print cells to form living tissues. These artificial tissues mimic the physiology of natural cellular structures, which can potentially be used to create tissue models for clinical testing. Although the ultimate goal of printing transplantable living tissues is still challenging, the technology has huge potential for healthcare. A lot of research is also being conducted into 3D printing and time-release drug delivery. With 3D printing technology, several drugs could be printed into a single pill and then released in precise time, eliminating the need for patients to take multiple drugs. MIT researchers have already made notable advances in this area, having developed a new additive manufacturing method to make drugs and vaccines, which can release multiple doses of a medicine over a controlled period of time. In spite of these remarkable advances, additive manufacturing within the medical industry still faces certain challenges. Regulations for 3D printed medical devices are one such challenge with medical device manufacturers obliged to meet strict requirements. However, additive manufacturing has taken deep roots in the medical industry and as the technology matures and the knowledge expands, it will eventually bring lower costs and more advanced applications such as 3D printing of organs and tissues. This is the second in our Industry and AM series — why not check out our last article on how AM is impacting the construction industry?